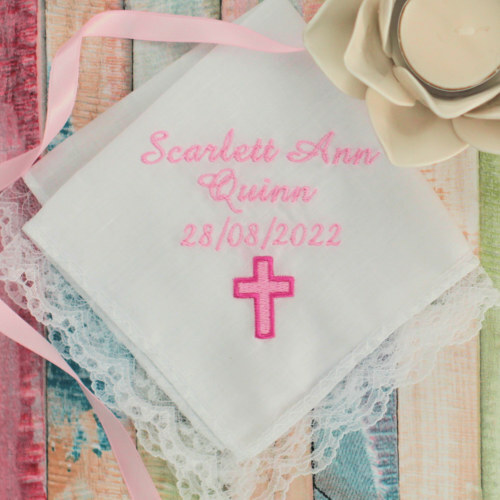 Ladies Lace handkerchief embroidered with a Holy Cross motif and a name, initials or brief message of your choice. Ladies Lace handkerchief embroidered with a Holy Cross motif and a name, initials or brief message of your choice. Nice gift for a Christening, Baptism or Wedding. We offer as standard a ladies white cotton lace trim handkerchief OR if you require a more luxurious fabric we offer a pure Irish linen lace trim handkerchief.